How to predict saving? 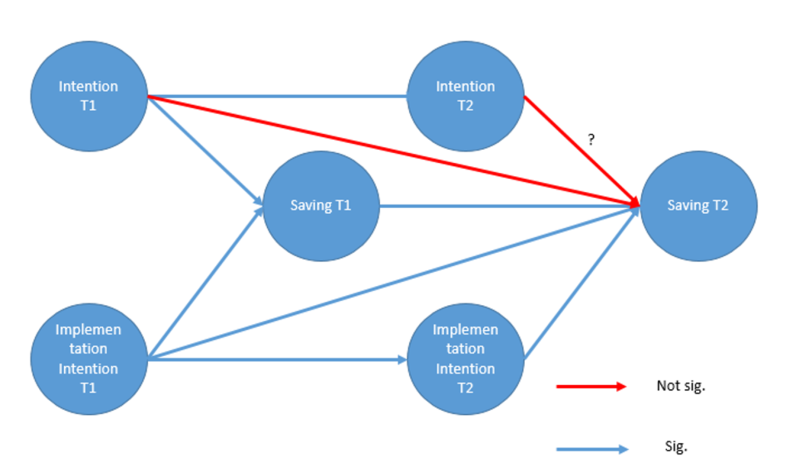 Role of the implementation intention. Behaviours which relate to low ability to save such as unplanned spending, habitual succumbing to temptations and lack of control over finances are hard to change and maintain. Most social cognitive theories assume that the intention to the desired behaviour is its best predictor (Ajzen, 1985; Prochaska, Wright, & Velicer, 2008; Steinmetz, Knappstein, Ajzen, Schmidt, & Kabst, 2016). These theories are very good for explaining variance in intentions, but they are less able to deal with behaviour prediction. They do not take into account the fact that people often behave contrary to their intentions. The reasons for this are unforeseen obstacles, indulging in temptation, procrastination, lack of energy and also lack of mental ability to act. Khul indicates intention realisation must be supported by a behavioural system of action control (Kuhl, 2000). Without its activation through positive affect regulation, the will to action is only represented in memory, but not in the behavior (Goschke & Kuhl, 1993). He describes this situation as state orientation. Transition from this state to action state and intention execution must be supported by cognition mechanisms which modulate the affect and thus facilitate initiation and control over behaviour. The concept of control has particular importance in the discussed area of saving. Literature supports the hypothesis that action control plays a crucial role in the context of consumer decisions and financial actions (Baumeister, 2002; Faber & Vohs, 2011; Koran, Faber, Aboujaoude, Large, & Serpe, 2006; Sotiropoulos & d’Astous, 2013), and its low level leads to adverse economical, health, social and legal consequences (Drever et al., 2015; Jian, Chen, & Chen, 2014; Taylor, Jenkins, & Sacker, 2011; von Stumm, Fenton O’Creevy, & Furnham, 2013; Worthy, Jonkman, & Blinn-Pike, 2010). From the above results it may be concluded that action control is one of the clear determinants of financial behaviours and their effects. Therefore, from the perspective of explaining the struggle to save, it may be assumed that money can effectively be put aside through treating saving as an area in which motivations and action control are elements of a financially healthy lifestyle (Dholakia, Tam, Yoon, & Wong, 2016). This lifestyle manifests itself in habitual, routine activities and occasional striving to put money aside, and also efforts toward maintaining financial well-being (Bagozzi & Warshaw, 1990; Dholakia et al., 2016). Due to the personal and social benefits of such behaviours, they can be equated with strengthening and maintaining a physically healthy lifestyle (Ouellette and Wood, 1998; Renner et al., 2008). A saving lifestyle may be considered as an area consisting of two stages with distinctive patterns of behaviour. The first is the process of motivation which evokes an intention towards the desired behavior (Ajzen, 1985, 1991). and second is a volitional step which supports the realisation of the intention and control over a behaviour accordingly, in line with the intention in question (Bandura & Adams, 1977; Gollwitzer, 1999; Kuhl, 2000). After a person develops an intention, he or she must turn it into a detailed vision of how to perform specific actions and what to do to maintain them. This is not achieved by a single act of will determined by intention. This requires cognitive skills and self-control strategies. Variable which relate to this area in this work will be the implementation intention. It refers to the formulation plans for „when”, „where” and “how” to perform given behaviour. Such an action is something more than an extension of a simple intention, because it allows the creation in advance of a cognitive representation of the situation in which one can perform a previously planned sequence of behaviours. When such situational cues are encountered, action specified in this way can be triggered automatically. Meta-analysis has proved that formulating plans in this manner has a significant impact on achieving consumer goals (Gollwitzer & Sheeran, 2006). 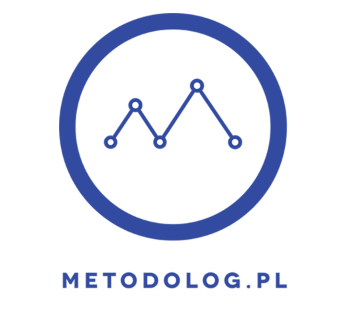 The overall objective of the study will be to verify the predictions resulting from theoretical premises concerning the casual mechanism explaining the saving lifestyle. What is the reason for saving? Do people save by the wish to save or maybe because of the ability to control their behavior in the context of saving? The easiest way to verify the superiority of the behavior control mechanism, which is the implementation of intention, over the intention to behave is to run an experiment with a control group. That is manipulation of trainings focused on formulating intentions, implementation of intentions (Where, When, How and can save something?) and deferred measurement of their effects. According to theoretical premises, teaching how to control behavior should have an impact on the level of savings and saving behaviors. However, another way to verify this prediction is to control the intra-individual variability of these variables. In order to decide what affects the level of savings, longitudinal research scheme could be made. The study would consist of two stages, that is measure in time one and measure in time two. In these steps, the intentions for saving, implementation of intention and saving money would be measured. Intention What are your intentions? The scale of answers: Not true, A little untruth, Little truth, Truth. With regard to the causes and effects of saving, the superiority of behavioral control over intention to behave should occur in the second measurement. Intention affects actual behavior, but ii is the control of action allows to maintain this action over time. It is anticipated that intention from the first measurement will have no effect on the saving behavior in the second measurement. The saving behavior would be explained behavior control. The intention in the second measurement should not significantly affect saving in the second measurement or would affect, but less than, behavior control. Below is the predicted causal model. Bagozzi, R. P., & Warshaw, P. R. (1990). Trying to Consume, 17(September). Faber, R. J., & Vohs, K. D. (2011). Self-regulation and spending: Evidence from impulsive and compulsive buying. Handbook of Self-Regulation: Research, Theory, and Applications, 537–550, NaN, 592. Kuhl, J. J. (2000). A functional-design approach to motivation and self-regulation.pdf. Handbook of Self-Regulation. Autorem tekstu jest Pan Konrad Hryniewicz. Dziękujemy! Newer Post Psychofizjologiczne podstawy antysemityzmu jako specyficznej formy rosizmu	Older Post Esej pod tytułem „Szczute piękno agresji”.